For an in-depth discussion of the details of the Pathfinder Ambassador Program, you can visit this post. However, if you'd prefer to stay here, the short version is this: if you have spent $25 USD or more on the mobile version of Pathfinder Adventures, or you own the Rise of the Runelords bundle on either or both of those platforms, you will receive a free Obsidian Edition upgrade for Pathfinder Adventures on Steam! The Obsidian Edition is the ultimate version of Pathfinder Adventures, and contains all the treasure cards, character alts, and upcoming goblin alts, as well as a whole bunch of other rewards like legendary dice, a bunch of in-game gold, and the exclusive Obsidian cards: Eder and Pallegina from our upcoming RPG Pillars of Eternity II: Deadfire that you can't get anywhere else! What if I didn't spend that much/don't own Rise of the Runelords? Even if you don’t qualify for the Pathfinder Ambassador Program, we still want to thank you for being a fan of Pathfinder Adventures. If you register on Obsidian.net, we'll give you a coupon for 10% off the game (and yes, it stacks with any ongoing sales! ), as well as the exclusive Obsidian cards, and 1000 gold. That coupon is only good for a very limited time, so don't wait! Is GOG available for the Pathfinder Ambassador Program? Unfortunately, no. The GOG version of the game is still in development and will not be able to participate in the program at this time. Now to the fun part! Follow the instructions below to create an Obsidian.net account (or sign in if you already have one), to redeem your rewards. 1. The first step is logging in to your Obsidian.net account, or creating a new account, if you don't have one. 2. 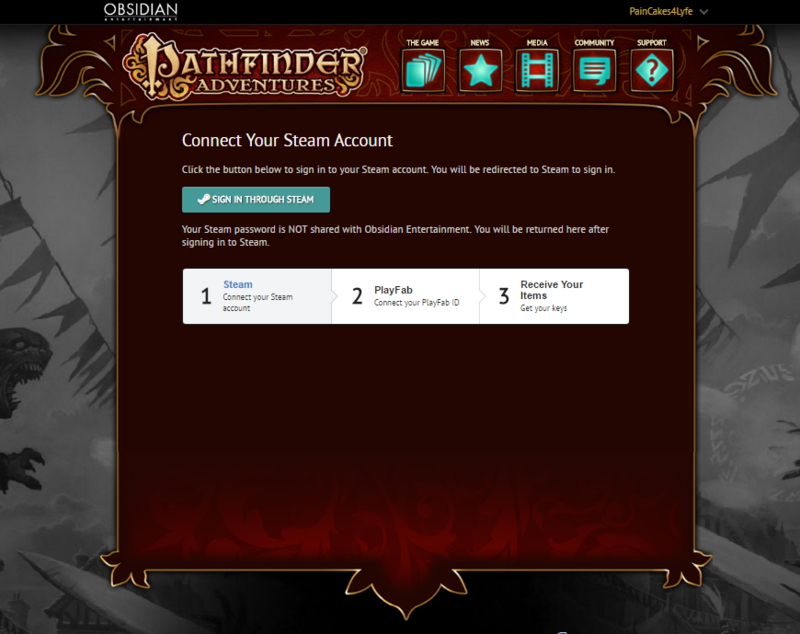 Once you have signed into your Obsidian.net account, visit the Pathfinder Adventures Steam Promotion page. 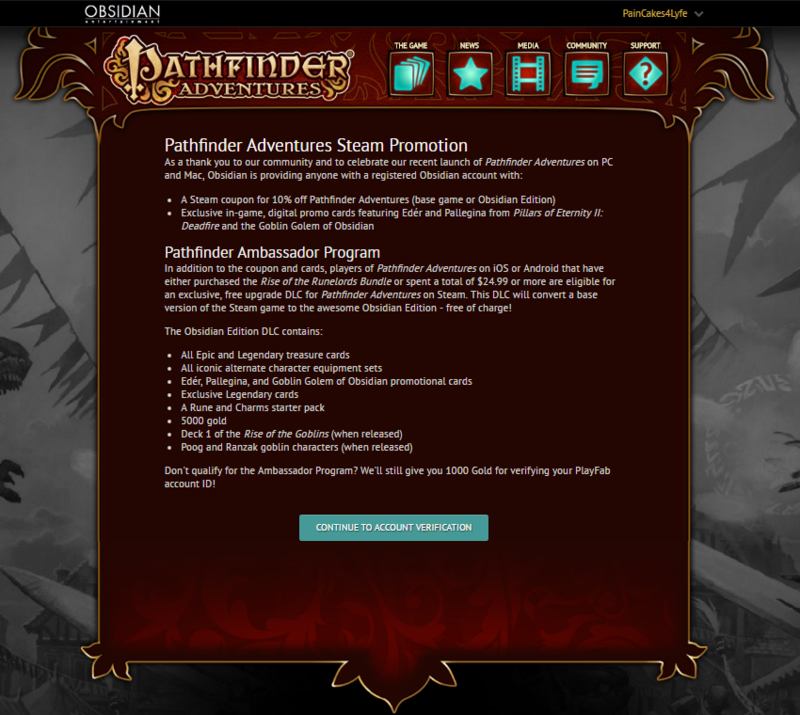 The Pathfinder Adventures Steam Promotion page will explain a little more about the Steam promotions and Pathfinder Ambassador Program. Please read the information carefully. 3. Press the “Continue to Account Verification” button to start the process of redeeming your rewards. 4. On the next page you will be prompted to verify your Steam account. 5. To verify your Steam account, press the “SIGN IN THROUGH STEAM” button. This will take you to Steam’s website so you can log in securely. 6. 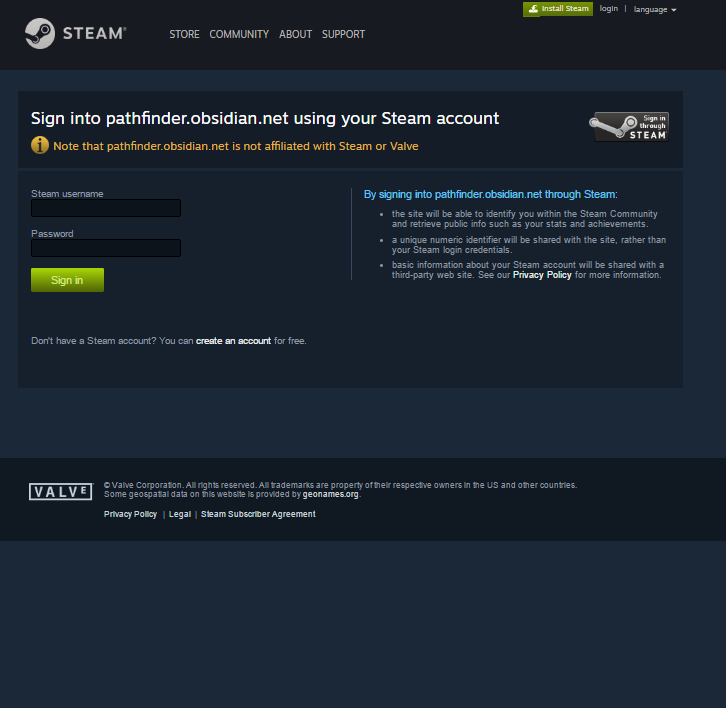 Enter in your Steam account’s credentials to link the Steam account to your Obsidian.net account. Linking this account allows Obsidian to unlock additional future content in Steam for Obsidian games. For example, there may be special content for Pathfinder Adventures owners in Pillars of Eternity II: Deadfire, you never know! 7. 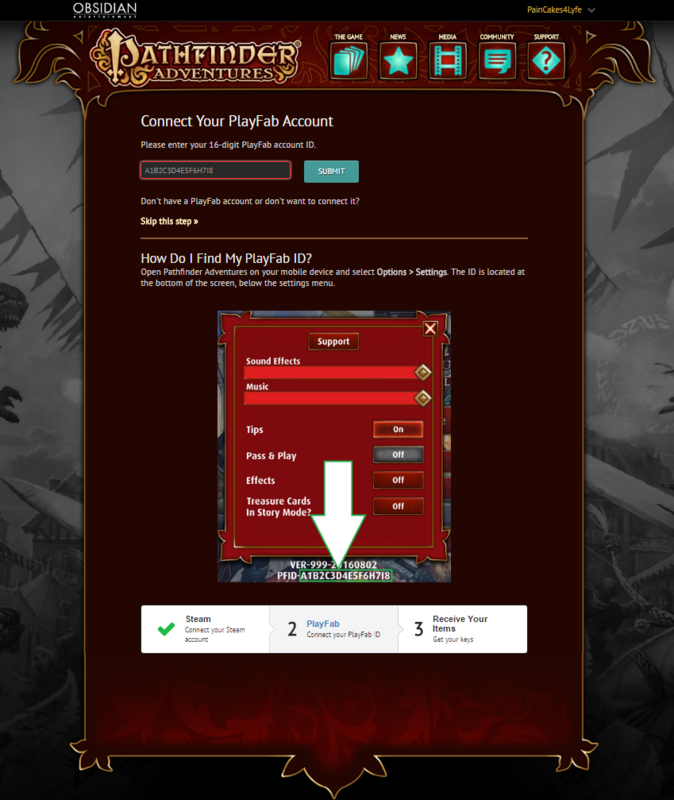 After you link your Steam account you will be prompted to enter in your Pathfinder ID (PFID). You can find this ID by pressing "Options" then "Settings" in Pathfinder Adventures on your mobile device. Once you have found your PFID, you will need to enter it in the textbox at the top of the page and press the “Submit” button. NOTE: You may skip this step, but if your PFID is not verified, you will not qualify for the Obsidian Edition upgrade DLC. To get the upgrade DLC you MUST enter in the PFID of the account that has spent $25 dollars or owns the Rise of the Runelords bundle. 8. After your account has been verified you will be given keys for your rewards. These rewards are redeemable through the Steam application. If you would like more information about redeeming your DLC and coupons, click on the “How do I activate a product on Steam?” link. 9. At this point, the process is complete and you can start redeeming your rewards on Steam. 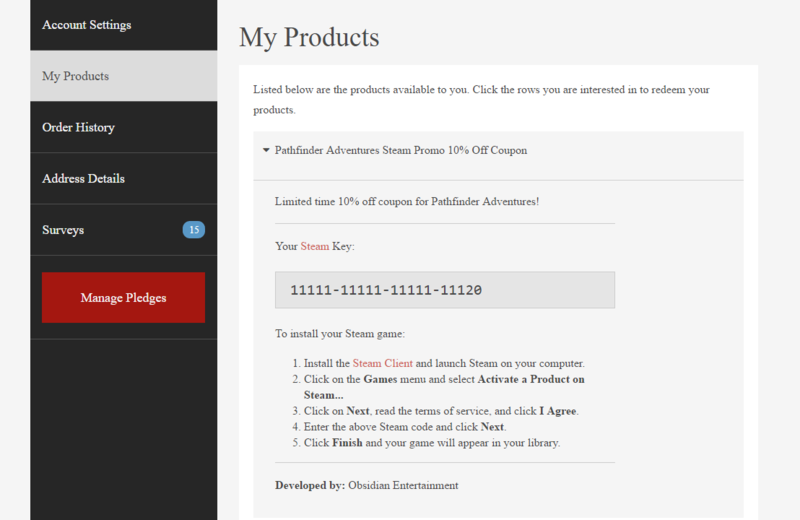 If you ever need to reference your keys again, you can visit (the "My Products" page on your Obsidian.net account). Just click on the Upgrade or Coupon entries to expand those sections and find your keys. Once again, Obsidian would like to thank you for supporting Pathfinder over the past year. Now to take down the Runelords! For those who like me were confused and got a "wrong PFID" error message when trying to link your account, the work around is that you should not connect to your asmodee account on steam before trying to link, it will auto connect you once linked. I sure wish you had sent this out BEFORE I bought it on sale... coupon's kind of useless now. So is there an expiration date to do this - for those of us who decided to not buy into the Steam version at this time? it would seem that this process requires you to actually HAVE the Steam version at this time to take advantage of it. You get a Steam coupon for the discount that is redeemable like a regular game. After that, 10% are subtracted from your purchase. Valid until March 31st. For the ambassador content itself, I believe linking your account is enough to qualify for the Obsidian version upgrade. You still need to purchase the base version, as far as I understand. I followed the steps, and previously bought RotR bundle on Android version, but i still can't access/download the free upgrade DLC. Why? I did the whole process and only got the 10% off coupon and 1000 gold. My game wasn't upgraded to the obsidian version. I spent over $25 on the ios version so what happened? How do I contact support as it errored and wouldn't let me put the pfid in again. tried unlinking to relink but cannot get any way to link steam and pfid at all now. Bought the PC game and no upgrade appears to have occurred. It seems like you don't yet own the Pathfinder Adventures game on Steam. Don't worry, whenever you get the game the above-mentioned items will be available to you! 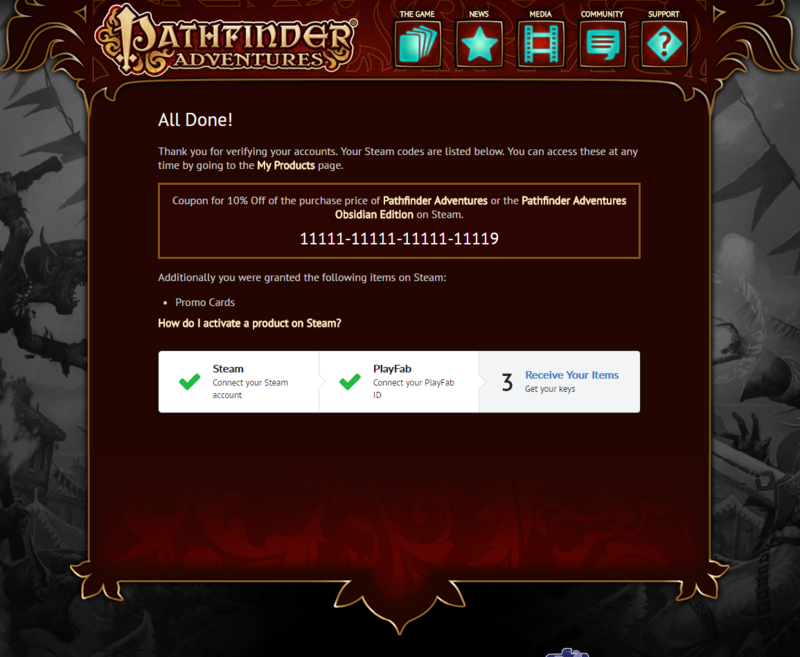 → Pathfinder Adventures Ambassador Program now live!